Unwind at the end of your busy and stressful month by making something with your own hands! Scientific research shows that creative arts can induce a relaxation response similar to activities such as yoga, meditation, deep breathing, and visual imagery. Each month a user-friendly project will be presented, or you can do your own thing with the materials in the studio. Yvonne, who has 30 years of experience leading art-making circles and workshops, will instruct, encourage, and inspire you. Everyone can create with Yvonne's supportive guidance. All materials provided. No previous art experience is necessary. This is a substance-free event. 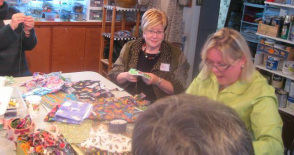 Pick a date… Gather your friends for an Arty Party at the Art barn Studio. BYOB and munchies. Choose a suggested project from the slideshow menu below – you’re not limited to a cookie-cutter paint-by-number experience. Yvonne will instruct, encourage, and inspire you with her 20 + years of experience as a multi-media artist and workshop facilitator. An abundance of materials will be provided for your playful enjoyment. No previous art experience is ever necessary. Everyone can create with Yvonne's supportive guidance. Please fill out contact form below so we can discuss the particulars of your event. Please contact me with questions, or to register.